This article is about a route, thoroughfare or way that supports travel by a means of conveyance. For a place outside a port a ship can lie at anchor, see Roadstead. For public roads, see Highway. For other routes, see Thoroughfare. For other uses, see Road (disambiguation). Roads consist of one or two roadways ( British English: carriageways), each with one or more lanes and any associated sidewalks (British English: pavement) and road verges. There is sometimes a bike path. Other names for roads include parkways, avenues, freeways, tollways, interstates, highways, or primary, secondary, and tertiary local roads. The Highways Act 1555 in Britain transferred responsibility for maintaining roads from government to local parishes. This resulted in a poor and variable state of roads. To remedy this, the first of the " Turnpike trusts" was established around 1706, to build good roads and collect tolls from passing vehicles. Eventually there were approximately 1,100 trusts in Britain and some 36,800 km (22,870 miles) of engineered roads. The Rebecca Riots in Carmarthenshire and Rhayader from 1839 to 1844 contributed to a Royal Commission that led to the demise of the system in 1844,  which coincided with the development of the UK railway system. In the late-19th century roading engineers began to cater for cyclists by building separate lanes alongside roadways. Road design is part of highway engineering. Structural road design is designing a road for its environment in order to extend its longevity and reduce maintenance. The Shell pavement design method is used in many countries for the design of new asphalt roadsides. where a road slopes towards the outside of a bend, increasing the likelihood that vehicles travelling at speed will skid or topple. Usually only a temporary situation during road maintenance. the route of the road, defined as a series of horizontal tangents and curves. 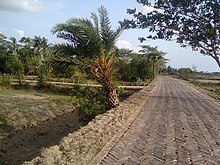 Unpaved road that is constructed of a material that does not create mud during rainfall. the slope of the road surface downwards away from the centre of the road, so that surface water can flow freely to the edge of the carriageway, or on bends angling of the surface to lean traffic 'into the bend' reducing the chance of a skid. A raised edge at the side of the roadway. (also kerb extension, bulb-out, nib, elephant ear, curb bulge and blister) Traffic calming measure, intended to slow the speed of traffic and increase driver awareness, particularly in built-up and residential neighborhoods. a state road or county road that connects rural or agricultural areas to market towns. (UK) Unsurfaced road, may be so infrequently used that vegetation colonises freely, hence 'green'. Many green lanes are ancient routes that have existed for millennia. Prevents vehicles from veering off the road into oncoming traffic, crashing against solid objects or falling from a road. Also called a guard rail or traffic barrier. a drainage channel usually at the edge of the road or along a median. A paved area beside a main road where cars can stop temporarily to let another car pass. One of a series of numbered markers placed along a road, often at regular intervals, showing the distance to destinations. Road built and maintained by a national authority. The road regarded as a geoconstruction. In the UK the term is road surface and the pavement is a pedestrian walkway alongside the road. (officially Pelicon crossing) (UK) a PEdestrian LIght CONtrolled crossing. the vertical alignment of a road, expressed as a series of grades, connected by parabolic curves. Often assigned to identify a stretch of public roads – often dependent on the type of road, with numbers differentiating between interstates, motorways, arterial thoroughfares, etc. Deviations from a true planar pavement surface, which affects vehicle suspension deflection, dynamic loading, ride quality, surface drainage and winter operations. Roughness have wavelengths ranging from 500 mm up to some 40 m. The upper limit may be as high as 350 m when considering motion sickness aspects; motion sickness is generated by motion with down to 0.1 Hz frequency; in an ambulance car driving 35 m/s (126 km/h), waves with up to 350 m will excite motion sickness. a road junction where typically three or more roads are joined by a circular section of road. Traffic 'on the roundabout' has priority over traffic on approach roads, unless indicated otherwise. In countries where traffic drives on the left the roundabout is travelled in a clockwise direction. Also known as an island in parts of the UK. A clear, level area to the side of the roadway available for stopping if needed. Deviations from a true planar pavement surface, which affects the interaction between road and tire. Microtexture have wavelengths below 0.5 mm, Macrotexture below 50 mm and Megatexture below 500 mm. "Roadbed" (from the 'related terms' Bed (geology) & streambed), as well as the term "Road building" redirects here. The completed road way is finished by paving or left with a gravel or other natural surface. 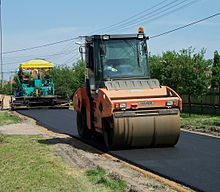 The type of road surface is dependent on economic factors and expected usage. Safety improvements such as traffic signs, crash barriers, raised pavement markers and other forms of road surface marking are installed. According to a May 2009 report by the American Association of State Highway and Transportation Officials (AASHTO) and TRIP – a national transportation research organization – driving on rough roads costs the average American motorist approximately $400 a year in extra vehicle operating costs. Drivers living in urban areas with populations more than 250,000 are paying upwards of $750 more annually because of accelerated vehicle deterioration, increased maintenance, additional fuel consumption, and tire wear caused by poor road conditions. When a single carriageway road is converted into dual carriageway by building a second separate carriageway alongside the first, it is usually referred to as duplication,  twinning or doubling. The original carriageway is changed from two-way to become one-way, while the new carriageway is one-way in the opposite direction. In the same way as converting railway lines from single track to double track, the new carriageway is not always constructed directly alongside the existing carriageway. Like all structures, roads deteriorate over time. Deterioration is primarily due to accumulated damage from vehicles, however environmental effects such as frost heaves, thermal cracking and oxidation often contribute. According to a series of experiments carried out in the late 1950s, called the AASHO Road Test, it was empirically determined that the effective damage done to the road is roughly proportional to the Fourth power of axle weight. A typical tractor-trailer weighing 80,000 pounds (36.287 t) with 8,000 pounds (3.629 t) on the steer axle and 36,000 pounds (16.329 t) on both of the tandem axle groups is expected to do 7,800 times more damage than a passenger vehicle with 2,000 pounds (0.907 t) on each axle. Potholes on roads are caused by rain damage and vehicle braking or related construction works. Virtually all roads require some form of maintenance before they come to the end of their service life. Pro-active agencies use pavement management techniques to continually monitor road conditions and schedule preventive maintenance treatments as needed to prolong the lifespan of their roads. Technically advanced agencies monitor the road network surface condition with sophisticated equipment such as laser/inertial Profilometers. These measurements include road curvature, cross slope, asperity, roughness, rutting and texture. Software algorithms use this data to recommend maintenance or new construction. Failure to maintain roads properly can create significant costs to society, in a 2009 report released by the American Association of State Highway and Transportation Officials (US) about 50% of the roads in the US are in bad condition with urban areas worse. The report estimates that urban drivers pay an average of $746/year on vehicle repairs while the average US motorist pays about $335/year. In contrast, the average motorist pays about $171/year in road maintenance taxes (based on 600 gallons/year and $0.285/gallon tax). Distress and serviceability loss on concrete roads can be caused by loss of support due to voids beneath the concrete pavement slabs. The voids usually occur near cracks or joints due to surface water infiltration. The most common causes of voids are pumping, consolidation, subgrade failure and bridge approach failure. Slab stabilization is a non-destructive method of solving this problem and is usually employed with other Concrete Pavement Restoration (CPR) methods including patching and diamond grinding. The technique restores support to concrete slabs by filing small voids that develop underneath the concrete slab at joints, cracks or the pavement edge. The process consists of pumping a cementitous grout or polyurethane mixture through holes drilled through the slab. The grout can fill small voids beneath the slab and/or sub-base. The grout also displaces free water and helps keep water from saturating and weakening support under the joints and slab edge after stabilization is complete. The three steps for this method after finding the voids are locating and drilling holes, grout injection and post-testing the stabilized slabs. Slab stabilization does not correct depressions, increase the design structural capacity, stop erosion or eliminate faulting. It does, however, restore the slab support, therefore, decreasing deflections under the load. Stabilization should only be performed at joints and cracks where loss of support exists. Visual inspection is the simplest manner to find voids. Signs that repair is needed are transverse joint faulting, corner breaks and shoulder drop off and lines at or near joints and cracks. Deflection testing is another common procedure utilized to locate voids. It is recommended to do this testing at night as during cooler temperatures, joints open, aggregate interlock diminishes and load deflections are at their highest. Ground penetrating radar pulses electromagnetic waves into the pavement and measures and graphically displays the reflected signal. This can reveal voids and other defects. The epoxy/core test, detects voids by visual and mechanical methods. It consists of drilling a 25 to 50 millimeter hole through the pavement into the sub-base with a dry-bit roto-hammer. Next, a two-part epoxy is poured into the hole – dyed for visual clarity. Once the epoxy hardens, technicians drill through the hole. If a void is present, the epoxy will stick to the core and provide physical evidence. 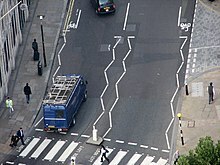 Pedestrian crossing, line markings and street furniture. Careful design and construction of roads can increase road traffic safety and reduce the harm (deaths, injuries, and property damage) on the highway system from traffic collisions. On neighborhood roads traffic calming, safety barriers, pedestrian crossings and cycle lanes can help protect pedestrians, cyclists, and drivers. Lane markers in some countries and states are marked with Cat's eyes or |Botts dots, bright reflectors that do not fade like paint. Botts dots are not used where it is icy in the winter, because frost and snowplows can break the glue that holds them to the road, although they can be embedded in short, shallow trenches carved in the roadway, as is done in the mountainous regions of California. For major roads risk can be reduced by providing limited access from properties and local roads, grade separated junctions and median dividers between opposite-direction traffic to reduce likelihood of head-on collisions. Speed limits can improve road traffic safety and reduce the number of road traffic casualties from traffic collisions. In their World report on road traffic injury prevention report, the World Health Organization (WHO) identify speed control as one of various interventions likely to contribute to a reduction in road casualties. Careful design and construction of a road can reduce any negative environmental impacts. De-icing chemicals and sand can run off into roadsides, contaminate groundwater and pollute surface waters;  and road salts can be toxic to sensitive plants and animals. Sand applied to icy roads can be ground up by traffic into fine particulates and contribute to air pollution. Roads are a chief source of noise pollution. In the early 1970s it was recognized[ by whom?] that design of roads can be conducted to influence and minimize noise generation. Noise barriers can reduce noise pollution near built-up areas. Regulations can restrict the use of engine braking. Traffic flows on the right or on the left side of the road depending on the country. In countries where traffic flows on the right, traffic signs are mostly on the right side of the road, roundabouts and traffic circles go counter-clockwise/anti-clockwise, and pedestrians crossing a two-way road should watch out for traffic from the left first. In countries where traffic flows on the left, the reverse is true. Society depends heavily on efficient roads. In the European Union (EU) 44% of all goods are moved by trucks over roads and 85% of all people are transported by cars, buses or coaches on roads. The term was also commonly used to refer to roadsteads, waterways that lent themselves to use by shipping. Eurasia, Africa, North America, South America, and Australia each have an extensive road network that connects most cities. The North and South American road networks are separated by the Darién Gap, the only interruption in the Pan-American Highway. Eurasia and Africa are connected by roads on the Sinai Peninsula. The European Peninsula is connected to the Scandinavian Peninsula by the Øresund Bridge, and both have many connections to the mainland of Eurasia, including the bridges over the Bosphorus. Antarctica has very few roads and no continent-bridging network, though there are a few ice roads between bases, such as the South Pole Traverse. Bahrain is the only island country to be connected to a continental network by road (the King Fahd Causeway to Saudi Arabia). Even well-connected road networks are controlled by many different legal jurisdictions, and laws such as which side of the road to drive on vary accordingly. Many populated domestic islands are connected to the mainland by bridges. A very long example is the 113 mi (182 km) Overseas Highway connecting many of the Florida Keys with the continental United States. Even on mainlands, some settlements have no roads connecting with the primary continental network, due to natural obstacles like mountains or wetlands, remoteness, or general expense. Unpaved roads or lack of roads are more common in developing countries, and these can become impassible in wet conditions. As of 2014, only 43% of rural Africans have access to an all-season road. Due to steepness, mud, snow, or fords, roads can sometimes be passable only to four-wheel drive vehicles, those with snow chains or snow tires, or those capable of deep wading or amphibious operation. Most disconnected settlements have local road networks connecting ports, buildings, and other points of interest. Where demand for travel by road vehicle to a disconnected island or mainland settlement is high, roll-on/roll-off ferries are commonly available if the journey is relatively short. For long-distance trips, passengers usually travel by air and rent a car upon arrival. If facilities are available, vehicles and cargo can also be shipped to many disconnected settlements by boat, or air transport at much greater expense. The island of Great Britain is connected to the European road network by Eurotunnel Shuttle – an example of a car shuttle train which is a service used in other parts of Europe to travel under mountains and over wetlands. Road transport of people and cargo by may also be obstructed by border controls and travel restrictions. For example, travel from other parts of Asia to South Korea would require passage through the hostile country of North Korea. Moving between most countries in Africa and Eurasia would require passing through Egypt and Israel, which is a politically sensitive area. Some places are intentionally car-free, and roads (if present) might be used by bicycles or pedestrians. Roads are under construction to many remote places, such as the villages of the Annapurna Circuit, and a road was completed in 2013 to Mêdog County. Additional intercontinental and transoceanic fixed links have been proposed, including a Bering Strait crossing that would connect Eurasia-Africa and North America, a Malacca Strait Bridge to the largest island of Indonesia from Asia, and a Strait of Gibraltar crossing to connect Europe and Africa directly. ^ a b c d e f Lay, Maxwell G (1992). Ways of the World: A History of the World's Roads and of the Vehicles that Used Them. Rutgers University Press. ISBN 978-0-8135-2691-1. ^ "Glossary of Statistical Terms". OECD. 2004-02-26. Retrieved 2007-07-17. ^ "What is the difference between a road and a street?". Word FAQ. Dictionary.com (Lexico Publishing Group, LLC). 2007. Retrieved 2007-03-24. ^ "Road Infrastructure Strategic Framework for South Africa; A Discussion Document". National Department of Transport (South Africa). Archived from the original on 2007-09-27. Retrieved 2007-03-24. ^ "The road user and the law". ^ a b "The road user and the law". Most of the provisions apply on all roads throughout Great Britain, although there are some exceptions. 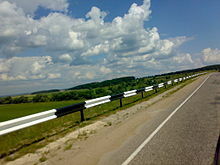 ^ "Local government law – Highway law". Historically, a highway comprehended any path in which members of the public had the right to pass and re-pass without let or hindrance. The term embraced footpaths, bridleways, driftways and so forth. The advent of the motor vehicle and its peculiar requirements has seen increasing distinctions between paths over which walkers and riders have a right of way and those ways that are predominantly used by motor vehicles. The former may be usefully termed "rights of way" (and are the subject of a separate entry in this web) and the latter may be termed "highways." ^ "road". The Free Dictionary. ROAD. A passage through the country for the use of the people. 3 Yeates, 421. 2. Roads are public or private. Public roads are laid out by public authority, or dedicated by individuals to public use. The public have the use of such roads, but the owner of the land over which they are made and the owners of land bounded on the highway, have, prima facie, a fee in such highway, ad medium filum viae, subject to the easement in favor of the public... Private roads are, such as are used for private individuals only, and are not wanted for the public generally. ^ "Large economic gains can come from mundane improvements in policy". The Economist. Retrieved 2018-10-25. ^ "Top gear". BBC. 2010. Retrieved 2010-09-08. ^ Helbing, D.; Molnär, P.; Farkas, I.J. ; Bolay, K. (2001). "Environment and Planning B: Planning and Design 2001, volume 28 (Self-organizing pedestrian movement)" (PDF). Environment and Planning B: Planning and Design. 28 (3): 376. doi: 10.1068/b2697. ^ "Marshalls Heath Nature Reserve". History. wheathampstead.net. 24 February 2003. Retrieved 2007-04-28. ^ "The Icknield Way Path". Icknield Way Association. 2004. Retrieved 2007-04-29. ^ "The Somerset Levels (the oldest timber trackway discovered in Northern Europe)". Current Archaeology 172. Current Archaeology. February 2001. Archived from the original on 2007-03-11. Retrieved 2007-03-25. ^ a b c d e O'Flaherty, Coleman A. (2002). Highways: The Location, Design, Construction & Maintenance of Road Pavements. Elsevier. ISBN 978-0-7506-5090-8. ^ "Oldest Trackway found in Plumstead". Archaeology.about.com. 2009-08-15. Retrieved 2013-08-14. ^ "London's earliest timber structure found during Belmarsh prison dig". Eurekalert.org. 2009-08-12. Retrieved 2013-08-14. ^ Anastasia Loukaitou-Sideris, Renia Ehrenfeucht (2009). Sidewalks: Conflict and Negotiation Over Public Space. MIT Press. p. 15. ISBN 978-0-262-12307-5. Retrieved 18 November 2018. The first sidewalks appeared around 2000 to 1990 B.C. [...] in central Anatolia (modern Turkey) [...]. ^ Lendering, Jona. "Royal Road". History of Iran. Iran Chamber of Society. Retrieved 2007-04-09. ^ Boederman, John (1997). The Cambridge Ancient History. Cambridge University Press. p. 178. ISBN 978-0-521-22804-6. ^ "Horseboating". The Horseboating Society. Retrieved 2007-04-09. ^ "Horses and Canals 1760–1960 The people & the horses". Horse Drawn Boats. Canal Junction Ltd. Retrieved 2007-04-09. ^ a b Hart-Davis, Adam (2001-06-01). "Roads and surveying". Discovering Roman Technology. BBC.CO.UK. Retrieved 2007-04-22. ^ Kasem Ajram (1992). The Miracle of Islam Science (2nd ed.). Knowledge House Publishers. ISBN 978-0-911119-43-5. ^ "The Rebecca Riots". Rebecca and her daughters come to Rhayader. Victorian Powys for Schools. March 2002. Retrieved 2007-04-28. ^ a b "How wide is a Dutch cycle path?". 2011-06-29. ^ "Kitsap County Road Standards 2006". Kitsap County, Washington. 2006. Archived from the original (Doc) on July 9, 2006. Retrieved 2007-04-20. ^ "Washington State County Road Standards". Chapter 35.78 RCW requires cities and counties to adopt uniform definitions and design standards for municipal streets and roads. Municipal Research & Services Center of Washington. 2005. Archived from the original on 2007-09-27. Retrieved 2007-04-20. ^ a b c d e f g h Shire of Wyndham East Kimberly (October 2006). "Guidelines for rural road design and construction technical specifications" (PDF). Western Australia (The Last Frontier). Archived from the original (PDF) on 2007-07-10. Retrieved 2007-04-24. ^ "Road Building Equipment". Constructing roads into forestry work areas. Caterpillar. 2007. Retrieved 2007-04-20. ^ "Volvo Construction Equipment (Europe)". Building the cities, towns, streets, highways and bridges in your neighborhood and in communities around the globe. Volvo. 2007. Archived from the original on 2006-10-27. Retrieved 2007-04-20. ^ Ron Bridle; John Porter (2002). The Motorway Achievement: Frontiers of Knowledge and Practice. Thomas Telford. p. 252. ISBN 978-0-7277-3197-5. ^ O'Flaherty, Coleman A. (2002). Highways: The Location, Design, Construction & Maintenance of Road Pavements. Elsevier. p. 252. ISBN 978-0-7506-5090-8. ^ Newcomb, David E.; Willis, Richard; Timm, David H. (2010). Perpetual Asphalt Pavements: A Synthesis (PDF). Lanham, Maryland: Asphalt Pavement Alliance. Retrieved 2013-01-22. ^ Asphalt Pavement Association. "Perpetual Pavement Award Winners". Retrieved 2013-01-22. ^ Theodore R. Ferragut; Dale Harrington & Marcia Brink (July–August 2002). "Road Map to the Future". United States Department of Transportation – Federal Highway Administration. Retrieved 2007-05-13. ^ ISG Resources, Inc (December 2003). "Fly Ash Concrete Design for Chicago's 100-Year Road Structure" (PDF). Case Study. U.S. Environmental Protection Agency. Retrieved 2007-05-13. ^ Uzarowski, Ludomir; Maher, Michael; Farrington, Gary; Golder Associates Ltd. (2005). "Thin Surfacing – Effective Way of Improving Road Safety within Scarce Road Maintenance Budget" (PDF). Paper for presentation at the 2005 Annual Conference of the Transportation Association of Canada in Calgary, Alberta. Transportation Association of Canada. Archived from the original (PDF) on 2008-04-07. Retrieved 2007-05-14. ^ "Dowel Bars for New and Existing Concrete Pavements" (PDF). Washington State Department of Transportation. February 2013. Retrieved 24 March 2014. ^ "Practical guidelines for CPR of Urban Roads: A compelling need for preserving city concrete streets led to the development of a methodology for scoping repairs and the undertaking of a comprehensive concrete pavement repair program in Grand Rapids, Michigan". June 2005. Better Roads. ^ How States Preserve Concrete Pavements: CPR pays off in extra pavement life. Better Roads. August 2005. ^ Neteler, Markus (2007). Open Source GIS: A GRASS GIS Approach. p. 149. ^ Yafeng Yin, Jian Lu, Wei Wang, Icctp 2011: Towards Sustainable Transportation Systems (2011), p. 1807. ^ Radu Popescu-Zeletin, Karl Jonas, Idris A. Rai, e-Infrastructure and e-Services for Developing Countries (2012), p. 141. ^ IEEE ITSS, IEEE Intelligent Vehicles Symposium (2005), p. 154. ^ Fred Bayles, Field Guide to Covering Local News (2012), p. 1. ^ Pittsburgh Light Rail Transit Reconstruction: Environmental Impact Statement. The Administration. 1979. ^ Davenport, John; Davenport, Julia L. (2006). The Ecology of Transportation: Managing Mobility for the Environment. Springer Science & Business Media. ISBN 978-1-4020-4504-2. ^ Burton, G. Allen, Jr.; Pitt, Robert (2001). "2". Stormwater Effects Handbook: A Toolbox for Watershed Managers, Scientists, and Engineers. New York: CRC/Lewis Publishers. ISBN 978-0-87371-924-7. ^ Charles Seawell and Newland Agbenowosi (1998). "Effects of Road Deicing Salts on Groundwater Systems." Archived 2009-05-21 at the Wayback Machine Virginia Polytechnic Institute, Department of Civil Engineering. ^ "Traffic-related Air Pollution near Busy Roads". American Journal of Respiratory and Critical Care Medicine Vol 170. pp. 520–26. 2004. ^ "Road Dust – Something To Sneeze About." Science Daily, 1999-11-30. ^ Unger, N.; Bond, T.C. ; Wang, J.S. ; Koch, D.M. ; Menon, S.; Shindell, D.T. ; Bauer, S. (2010). "Attribution of climate forcing to economic sectors". Proceedings of the National Academy of Sciences. 107 (8): 3382–87. doi: 10.1073/pnas.0906548107. PMC 2816198. PMID 20133724. Retrieved 2013-08-14. ^ Ray (2007). "Why In Britain Do We Drive On The Left?". 2Pass.co.uk. Retrieved 2007-03-24. ^ Kincaid, Peter (1986). The Rule of the Road: An International Guide to History and Practice. Greenwood Press. ISBN 978-0-313-25249-5. ^ Lucas, Brian (2005). "Which side of the road do they drive on?". Retrieved 2006-08-03. ^ www.stat-usa.gov/ (2006-02-28). "International Market Research Reports". Australia CCG 2004 Update: Economic Trends and Outlook (E. Infrastructure ). Industry Canada. Archived from the original on 2007-11-14. Retrieved 2007-04-17. ^ "State and Federal Gasoline Taxes". Maps, Reports and history of gas tax in the United States. American Road & Transportation Builders Association ("ARTBA"). Archived from the original on 2007-04-08. Retrieved 2007-05-02. ^ "International Bridge, Tunnel and Turnpike Association". April 16, 2007. Retrieved 2007-04-17. ^ Cardno, Catherine (2008). "Infrastructure: New Report Examines the Potential of Public-Private Partnerships for Transportation Infrastructure". Civil Engineering. 78 (11). ISSN 0885-7024. ^ "Road Transport (Europe)". Overview. European Communities, Transportation. 2007-02-15. Archived from the original on 2007-03-15. Retrieved 2007-03-24. ^ "Thruway Fact Book". New York State Thruway Authority. Archived from the original on 2011-05-02. Retrieved 2011-05-05. 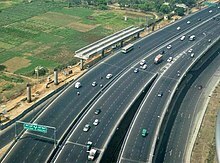 ^ "Expressways Being Built at Frenetic Pace". Archived from the original on 1 July 2007. Retrieved 10 January 2017. ^ Tracking Agrica's Progress in Figures (PDF). African Development Bank. 2014. p. 71. ^ "How to Get Here". Nunavut Tourism. Canadian Northern Economic Development Agency. Retrieved 10 January 2017.